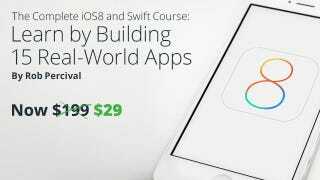 Udemy, one of the largest online marketplaces for learning, is offering one of their most popular classes, the Complete iOS8 & Swift Development Course, at an exclusive 80% off using promo code IOS-29. Regularly priced at $199, the Complete iOS8 & Swift Development Course is now just $29. In six weeks you'll be able to develop live action applications, like Instagram, that allow users to interact with one another across the web. Get the Complete iOS8 & Swift Development Course for just $29 - a savings of 80% - using promo code IOS-29. If app development is not for you, browse the full Udemy catalog and take 75% off the class of your choice with promo code GAWKERSAVES75. Terms and Conditions: Coupon code is not valid with any other promotional offer or discount and is valid until 12/26/14 11:59 PDT for the iOS8 coupon and 1/1/15 11:59 PDT for the generic code. One coupon code use only per purchase. Coupon code requires a Udemy account, and is subject to terms and conditions found here. Udemy reserves the right to cancel the coupon code at any time. Coupon code is not exchangeable for cash. Coupon code is not valid with purchases made on the Udemy iPhone, iPad or Android app. Some courses do not apply. If you return your purchase, you will be refunded the amount paid. Offer good while supplies last.